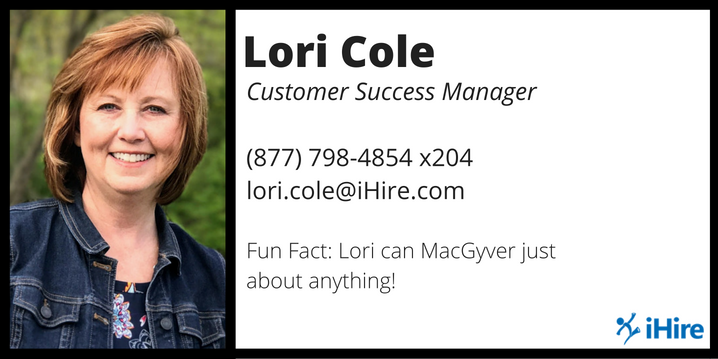 Meet your Customer Success Team Member, Lori Cole! Lori was one of iHire's founders in 1999 and returned as our Customer Success Manager in 2012. 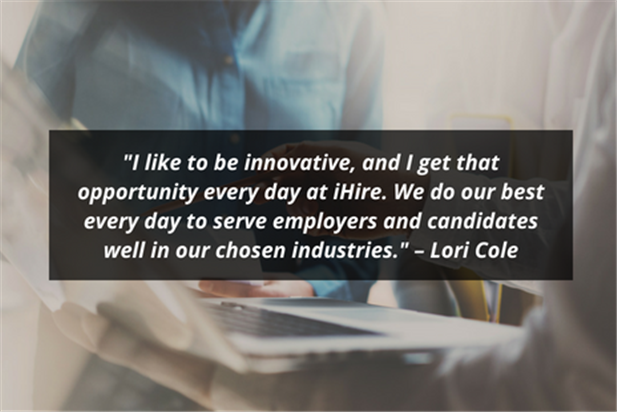 Learn more about Lori and the integral role she plays in iHire's strong reputation as a solutions-focused company. LC: I was born in Jacksonville, FL and left before I was two when my parents moved to the Ft. Wayne, IN area. LC: I like to be innovative, and I get that opportunity every day. My job is never boring or repetitious, and I’m always experimenting with new ideas and ways to make life easier for me and my team. In your opinion, what makes iHire different from other job boards/career platforms? LC: We aren’t trying to be everything to everybody. We’ve chosen our niche industries and do our best every day to serve the employers and candidates in those industries well. What did you do prior to working for iHire? LC: Before coming to iHire, I worked in staffing, recruiting, and sales as well as interior design for construction industries. What excites you about working in the recruiting, hiring, and/or job search space? LC: Online job search has always fascinated me and sometimes I’m surprised that the industry isn’t a bit further along given all of the technology available. I think at some point there will be a centralized service that plugs into all of the job boards and brings all of the services for employers and candidates together in one location. What’s the best piece of advice you would give a candidate who is not having any luck finding the right job? LC: First, figure out what you want to do when you grow up! I was faced with that dilemma a few years back while on the hunt for a new job, so I read the book “Do What You Are” by Paul D. Tieger and Barbara Barron-Tieger. This is the most-read and referenced book in my library. Additionally, after discovering my Myers Briggs personality type (ENFP), I was amazed at how closely the strengths and weaknesses sections aligned with who I am. The book gave a long list of career suggestions across several industries, and helped me to narrow down the types of careers that leverage my greatest strengths. If you are in doubt about your next career move, then I highly recommend this book. LC: I’m usually doing a new design project in my house in my free time. I’m constantly painting or repainting, and my kids tell me that my walls are going to fall down because of all of the coats of paint on them! I also like to spend time on the lake. LC: A flight attendant! It looked like a very glamorous job when I was a kid, though today I'm glad I chose another career path. What’s your favorite movie or book and why? LC: The Sound of Music is my favorite movie because I love the music and the scenery of Austria (I hope to go there someday). I listen to many self-development and business books on Audible while I’m painting or driving, but my guilty pleasure is the "Outlander" series. I’ve listened to all nine books in the series at least once. Anything else you’d like to share? Fun facts? LC: I have ten grandkids with one on the way. I can MacGyver just about anything!